Every fall my inbox gets filled with questions from parents about technology, internet, and their kids returning to school. I have combed through those messages, as well as frequently asked questions from presentations, to help answer what parents want to know most at this time of year. If you don’t see your question answered, give us a shout or leave a comment below. Whether you are sending your kids back to school with a new device or an existing one, take time to review privacy settings for both the device itself and the networks/apps they use. These settings are ‘subject to change’ with minimal notice and your children could be giving away more information than they intend. At the very least, both you and your children should check your settings for when you are giving away your location and allowing access to your microphone. I always advocate setting up a contract with your kids. This is not a way to control them but rather set up expectations between both of you. You can download ours or we walk you through writing your own. Keep in mind that if your child is under 18 then *you* own their phone contract through many carriers and are then accountable for the use of the phone. If you already have a contract, now is a great time to review it. Not all schools use filtering systems on their WiFi so your child could have access to anything on their browser. Some WiFi systems use filtering but only for school owned devices. Your child’s ‘guest’ devices could have free rein. If your child has a cellular enabled device, they can still use this on school grounds if they cannot get on the school’s WiFi system. Your child’s social network and app use will depend largely on what their friends use. I have found some schools are extensive users of one network, where as a school down the street has never heard of it. Before you start a conversation with your kids, keep in mind that many of these networks, games, and apps are how they communicate with their friends. If they feel like you may take it away they won’t tell you about it. Instead, approach them with curiosity and the intent to help them stay safe. If the school is providing an email it should be a Google For School email address. This is specific to the education system. It does not tie in to Google’s other networks and they do not track the content. Kids under 13 are not allowed on popular email systems like Gmail, Yahoo, and Hotmail. If your school is encouraging you to sign your child up then you can say no. Here is more information about why kids can’t have email and what emails addresses are appropriate. There are helpful school specific networks that allow students and teachers to communicate with each other. Though these are closed, make sure your child knows what the rules are around these networks. I have heard of an 8 year old girl being contacted by 12 year olds that she didn’t know. Despite being within the school, this made her uncomfortable. 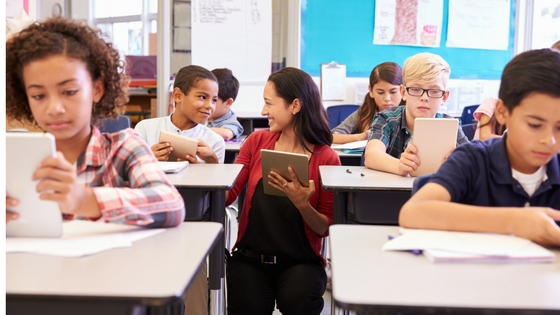 Many teachers now use networks like Instagram and Twitter in their classrooms. These can be great tools but that doesn’t make them safe for your young kids to use at home alone. Take time to learn about any networks they are using. Some schools have started providing chrome books or other tablets to students. Though there is often filtering in the school for web browsing, rarely do these tablets have filters outside the school. If a child takes their tablet to a coffee shop with free WiFi then they may be able to reach any content they want. If you have any concerns at all, contact the school. Many teachers I have spoken to very tech savvy and understand what the kids are using and how they are using it. That said, some teachers are just doing what they are told and may not be imparting on the safety rules on your kids. If you don’t like or don’t understand what’s going on then it is your right to ask. From Addiction Councillors: Watch for internet use taking over other daily activities, especially sleep. Gamers fall prey to this because online multiplayer games never end. When you log on there are always people playing that you can join. Without hard stops in gameplay, there are no easy triggers to turn it off. Watch the time limits your kids have online. From Optometrists: There are numerous studies in terms of the blue light emitted from screens. Additionally, with handheld tablets, kids hold them within inches of their faces. Most eye specialists are now advocating that kids under 10 not be on any small screen for more than an hour a day, if at all. From Psychologists: Social Media can be a great connector for people who are physically isolated but the act of browsing social media from a bedroom alone can lead to a sense of inadequacy. People are always comparing their backstage mess to everyone else’s highlight reel. Also, kids often uses the measurements of likes on Instagram/YouTube or streaks on Snapchat to gauge their value. Talk to kids about these things early. From Parents of older kids: Setting up guidelines at an early age is key. If very young kids are allowed free rein online then they will continue to expect it as they age. If online/internet/gaming time is treated as privilege and a reward then kids respect it as such. Many parents swear by rules like ‘homework first’ or ‘no devices at the dinner table’. These articles are also geared at parents and may help you along away. Always feel free to reach out with questions or concerns. In addition to seminars for schools, we also provide personal online audits and lots of free materials you can download to help you on your way.